On June 22, the Paraguayan Congress impeached President Fernando Lugo, a progressive who assumed office in 2008. 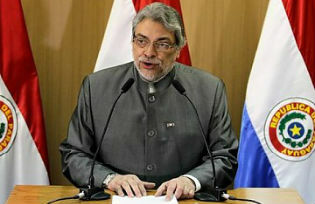 Although technically legal, Lugo’s removal threatens the very integrity of democracy in Paraguay. It is the latest in a disconcerting series of attacks against progressive governments in South America that highlights the vulnerability of its nascent democratic institutions and calls into question the trend of democratization in the region. Lugo’s victorious election campaign was historic. It ended more than 60 years of dominance by the Colorado Party. This right-wing coalition of landed and military elites used violence and coercion to dominate Paraguay through the extensive state bureaucracy created by dictator Alfredo Strossner, a Colorado strongman who ruled from 1954 to 1989. The Party’s legitimacy gradually eroded through its land-grabs and corruption scandals involving high-level officials. It was also implicated in political assassinations, most notably that of Vice President Luis Maria Argana in 1999, after which President Raul Cubas was forced to resign and flee the country. Lugo, a progressive who proposed numerous social reforms, was widely known in Paraguay as the “bishop of the poor.” Pledging to fight corruption, reduce poverty, and enact agrarian reform in a country where 38 percent of people live in poverty and 2 percent of the population controls 75 percent of fertile land, Lugo won 41 percent of the popular vote in 2008, beating out the Colorado candidate by 10 percentage points. Despite this electoral success, the conservative legislature and the tenuous coalition of center-right parties that helped bring him to power systematically frustrated Lugo’s progressive efforts at reform. Lugo was impeached on grounds of “malfeasance” after 17 people were killed in a clash between police and landless squatters protesting land inequality. This legal formality, however, obscures the fact that Lugo’s ouster, long-desired by those who opposed his democratic reforms, was politically motivated. The removal of Lugo is particularly disturbing because it is the latest in a series of actions against progressive populist governments in Latin America. In a 2009 coup, democratically elected Honduran President Manuel Zelaya, who had raised the national minimum wage despite strong opposition from the business elite, was removed at gunpoint. In 2010, Ecuadorean President Rafael Correa was tear-gassed, assaulted, and held captive by insurgent police officers in an attempted coup that ended in a shootout. An international fact-finding team arrived in Asuncion on Monday to collect information on the events leading up to the impeachment, Lugo’s satellite government, and the major players in the recent events. The U.S. State Department said it was “quite concerned” about the rapidity of Lugo’s impeachment. The United States is unlikely to take a more definitive stance until the OAS team submits its report in the coming days. One thing is certain: few people want a repeat of what happened in Honduras. Since the 2009 coup, political dissidents have been assassinated, minorities have been targeted, and violence and disorder have ensued. Honduras now has the world’s highest homicide rate. The fact-finding mission’s report should elucidate the details of a political upheaval that remains opaque. So far, there is no indication that any outside powers played a role in the coup. The impeachment’s rapidity and the vote’s unprecedented margin (in the House of Representatives, the vote was 73 in favor and 1 against impeachment) suggest that Lugo’s impeachment was not a response to his “malfeasance” surrounding the killings by the police. It was coordinated and politically motivated, likely by domestic landowning and business elites, with powerful allies in Congress, who opposed Lugo’s progressive agenda and preferred a return to the right-wing Colorado party. Ironically, the state that has benefitted the most from Lugo’s ouster may be Venezuela. Venezuela was selected to replace Paraguay in Mercosur after Paraguay’s membership was suspended.